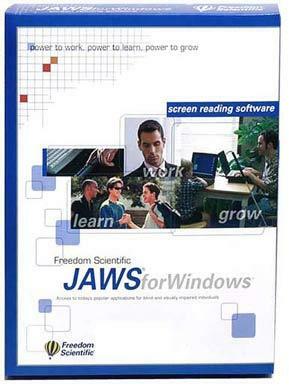 JAWS for Windows Version 15 Standard single licence (Windows Home Edition only). JAWS is a powerful accessibility solution that reads information on your screen using synthesized speech. JAWS provides many useful commands that make it easier to use programs, edit documents, and read web pages. All JAWS Professional products can be used with all 32-bit or 64-bit versions of Windows 8 Professional on both Tablets and Touch Screen computers. A processor capable of handling the requirements of the operating system in addition to any other programs you want to use with JAWS. Enough memory to run the operating system and any programs you want to use with JAWS. Additional memory will improve system performance while JAWS is running. JAWS requires less than 200 MB of hard disk space for program and settings files. Additional space is required for the operating system, other programs, and the Windows swap file. A display adapter capable of at least 800 x 600 screen resolution with 16-bit color (1024 x 768 screen resolution with 32-bit color is recommended). If you intend to use the Eloquence for JAWS software synthesizer, you need a sound card compatible with the version of Windows you are running. If you choose not to use Eloquence for JAWS, then you must have a JAWS compatible software or hardware speech synthesizer, or a refreshable braille display. Note: If you do not have a sound card, JAWS does not provide speech during installation. Contact listed suppliers to confirm features, options and models available.